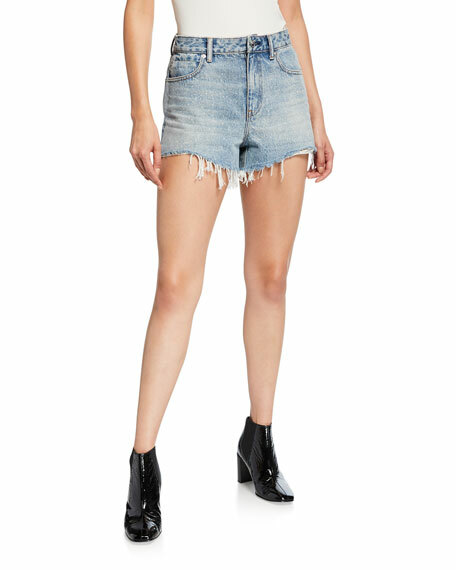 T by Alexander Wang shorts with light-wash denim at front and French terry at back. For in-store inquiries, use sku #2409801. 3x1 shorts in paneled stretch-denim. Approx. measurements: 2.5" inseam; 11.25" leg opening. High-rise; belt loops. Side pockets; back patch pockets. Straight legs. Destructed hem. Button/zip fly. Cotton/spandex. Made in USA of imported material.